It would strike you too, if you were me (the one weaving them all in before I can sew the individual pieces together). There are ways to break up the monotony, of course, but it’s still monotony no matter how you sugar-coat it. 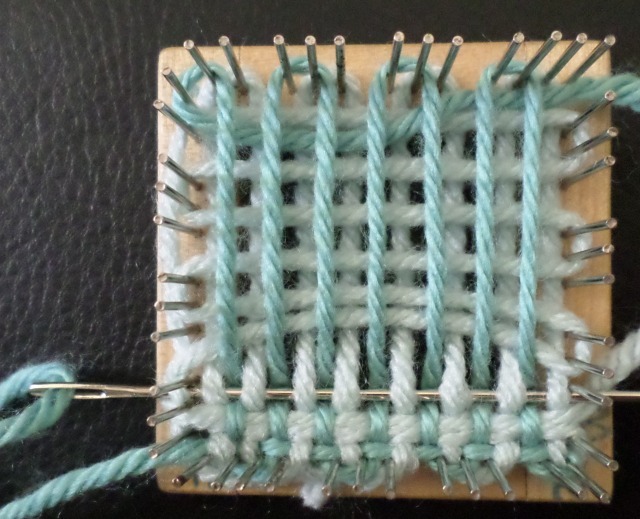 For the year and a half after I discovered pin loom weaving, I almost exclusively made squares. 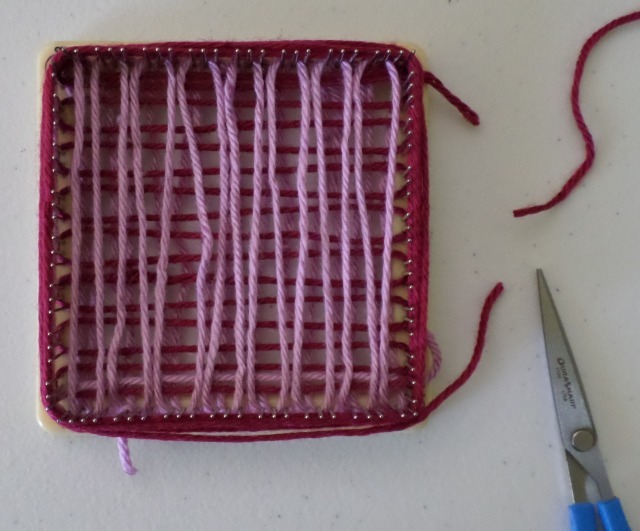 I was designing pattern weaves, and sewing the squares to each other was not on my horizon, so I let their tails wag. 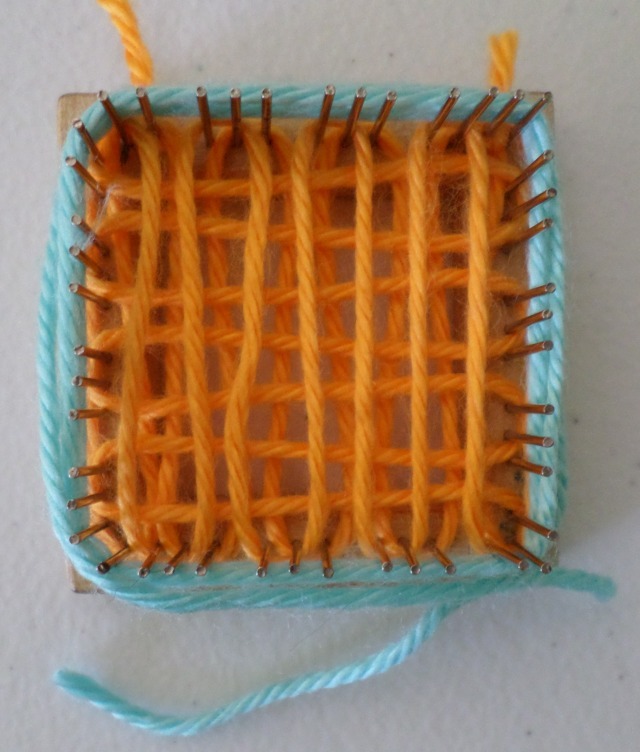 It wasn’t till recently that I started sewing my squares together into actual objects. Then I realized the necessity of swiftly and painlessly dealing with those ends. Some of my projects–like the trees and the star cushion, benefit from not having their ends worked in. 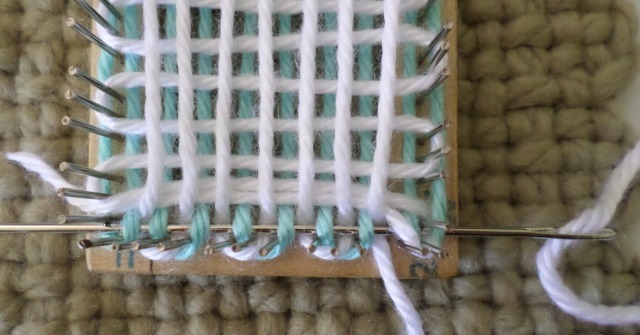 They end up inside the project, so why show a double row of weaving if you don’t have to? But now I’m making several two-sided projects and have learned that I don’t want ANY ENDS AT ALL EVER AGAIN to deal with (except perhaps the L4 end if I’m saving it to sew the pieces together–which is not always the case). 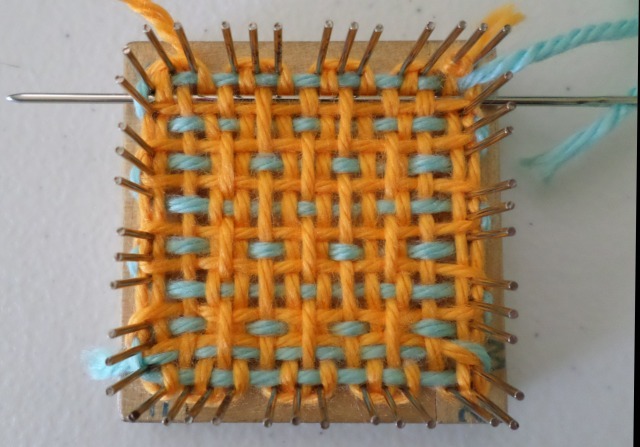 I used the 2″ square loom to expedite the many weavings I had to do for this post. Personally I think the 4″ squares look nicer, but I wanted to finish this post before my hairs all went white. Let me emphasize this is an intermediate to advanced set of techniques. Beginners can certainly use it though. 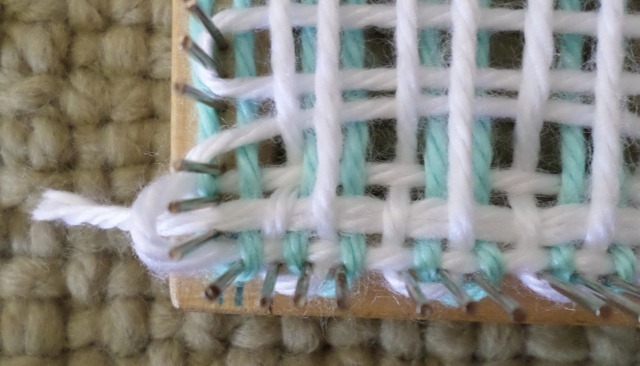 I recommend you become familiar with both ways of weaving–with and without yarn tails exposed–because both are useful. 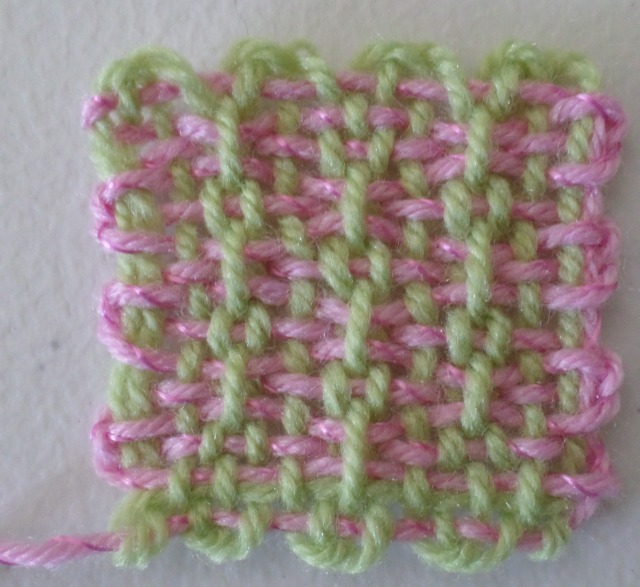 These techniques build on those presented in a previous blog post and video (see links in TECHNIQUE 2 — L1-3/L4 TWO-COLOR WARP, step 5 below). That said, let’s explore these revolutionary tail terminating techniques. I recommend doing, or at least studying, this method first. Hereafter I won’t re-explain the basic technique and will just say, “Place the L1 tail horizontally across the loom” or something like that. 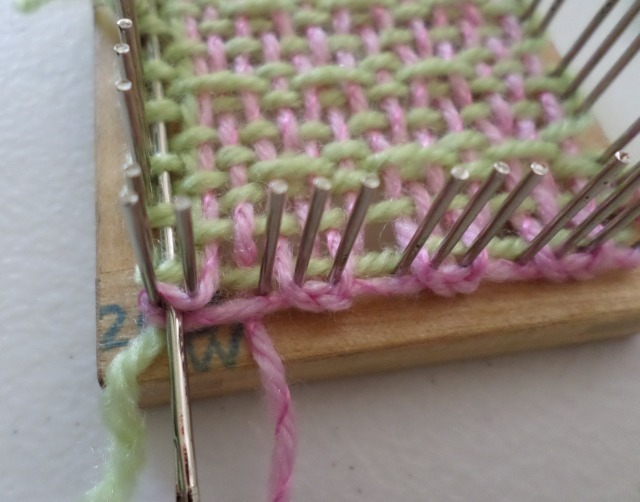 I wish to point out that I like to have my ends go all the way across the loom so there aren’t short little pieces that peter out halfway across. This is a matter of taste and you may choose to do yours however you like. ***REMEMBER: click on a photo to enlarge it. Click the back arrow to return to these instructions. Measure out the L1 tail: length of one side of the loom, plus a little bit. Keeping that tail length below Cr1, lay the yarn in place as for two-color weaving, i.e. to the left of pin #1 at Cr1, and in place at Cr3. Warp the rest of L1 as usual, then take the L1 tail around Cr1 and lay it in place horizontally across the loom as if it was the first strand of L2, i.e. between pins 1 and 2 on 1-3 edge and across to the first empty space on the 2-4 edge. Warp L2, taking yarn on top of L1 tail, then continue as usual. 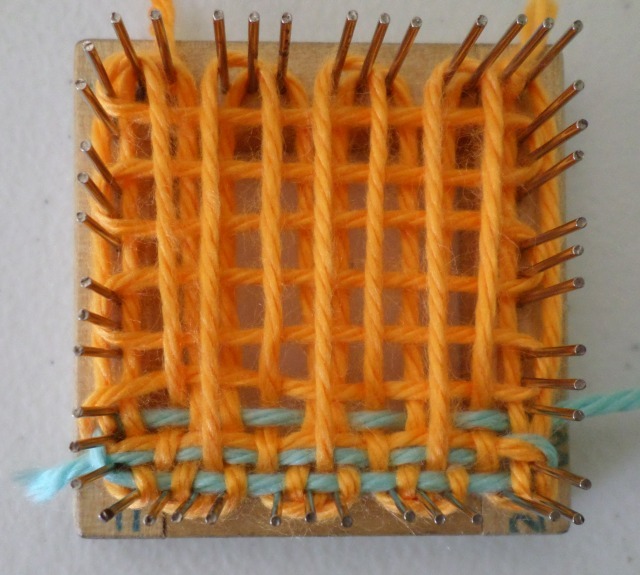 Warp L3, wrap yarn, cut and thread needle, then begin weaving R1. 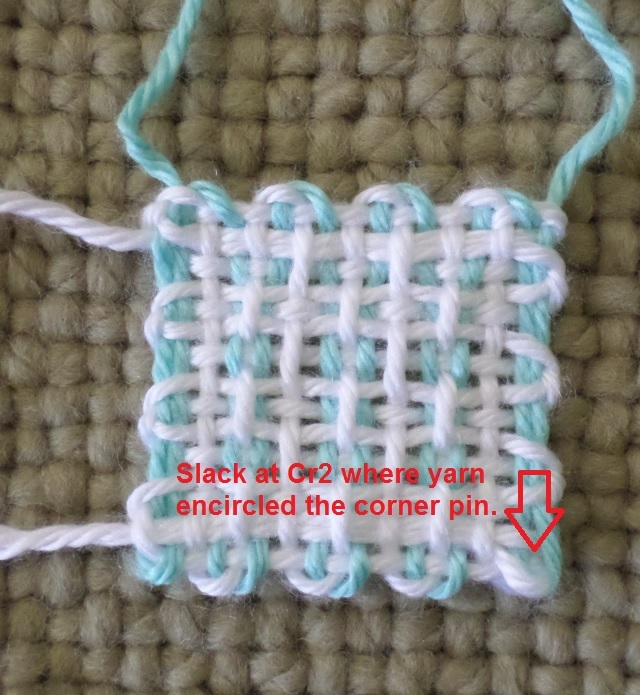 Notice when you come to the end of R1, weaving is a little difficult because L1 and L3 are sharing a pin space. Carefully weave Over the L3 strand and Under the L1 strand, then Over the outer loop. 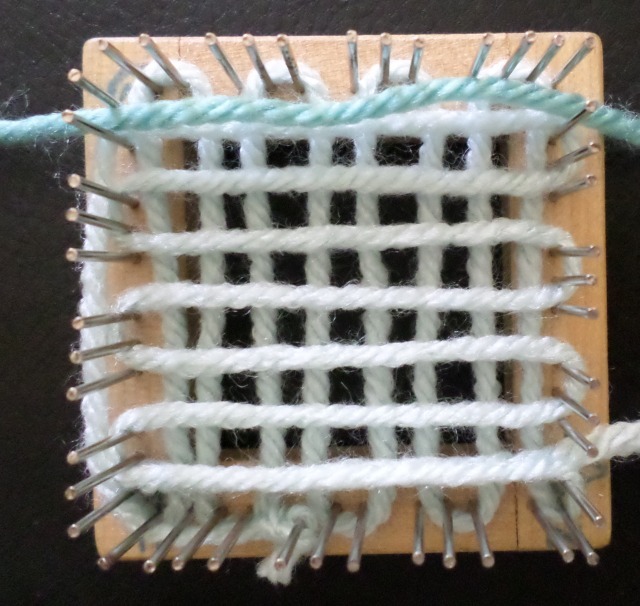 Continue weaving the rest of the square taking R2 above the double thick strand. 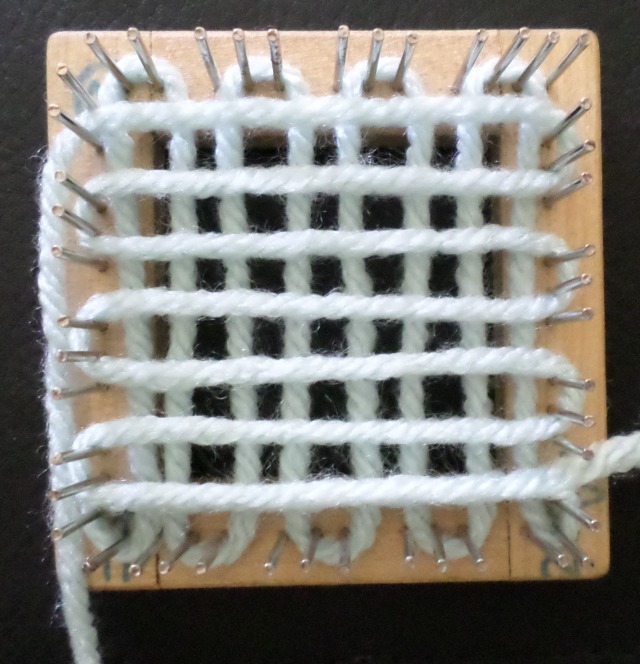 If you wish to work in the L4 tail, you may take it horizontally or vertically across the loom. The sample shows it going vertically from Cr4 to Cr2. You can treat the double strand as one strand, going Over both, or as two strands, going Over one strand and Under the next. 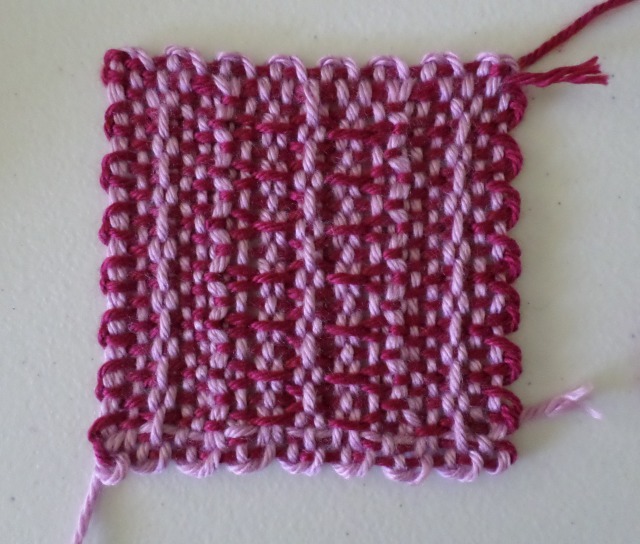 (You may also choose to weave in the L4 tail on the outside edge of the square, in which case you’ll imitate the stitches in that row. 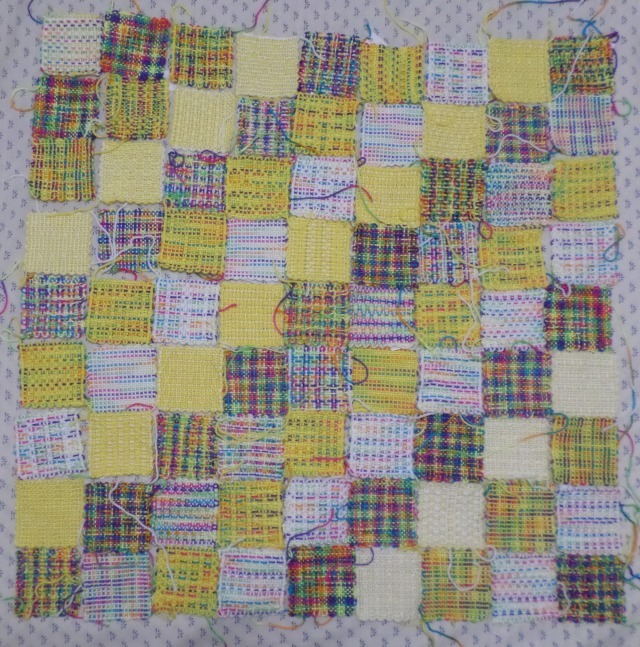 Finished square, no ends to work in! 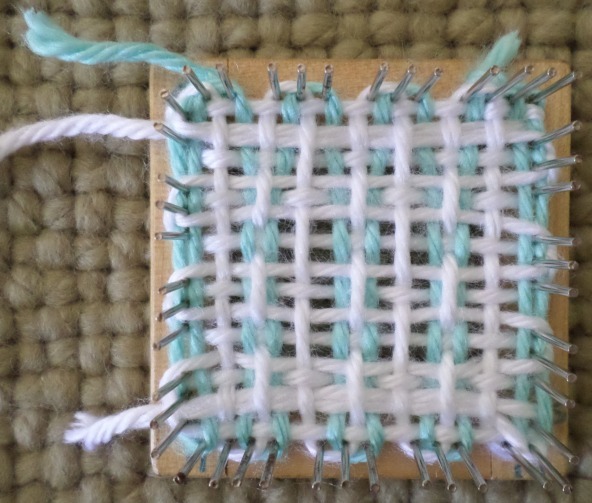 Remove the square from the loom and trim the excess yarn. The disadvantage of working in tails as you warp and/or weave, is that often your corners will get obscured. This may be problematic when you sew your squares together. Also, in one technique described below, the yarn tail ends up at Cr1 with no place to work it in; therefore, you would use it as a sewing tail and work it into the available row of the square it joins. Tie L1 yarn tail to the outside of the pins. From there on, warp as usual, then tie L3 yarn tail outside the 2-4 edge pins, near Cr 4. 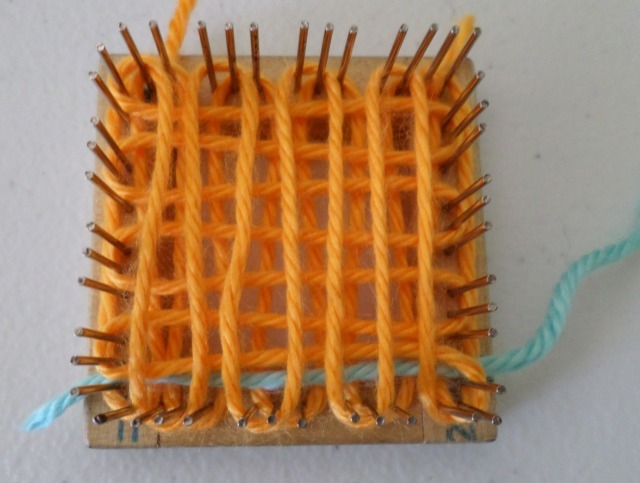 Tying yarn on the outside edges of the pins. 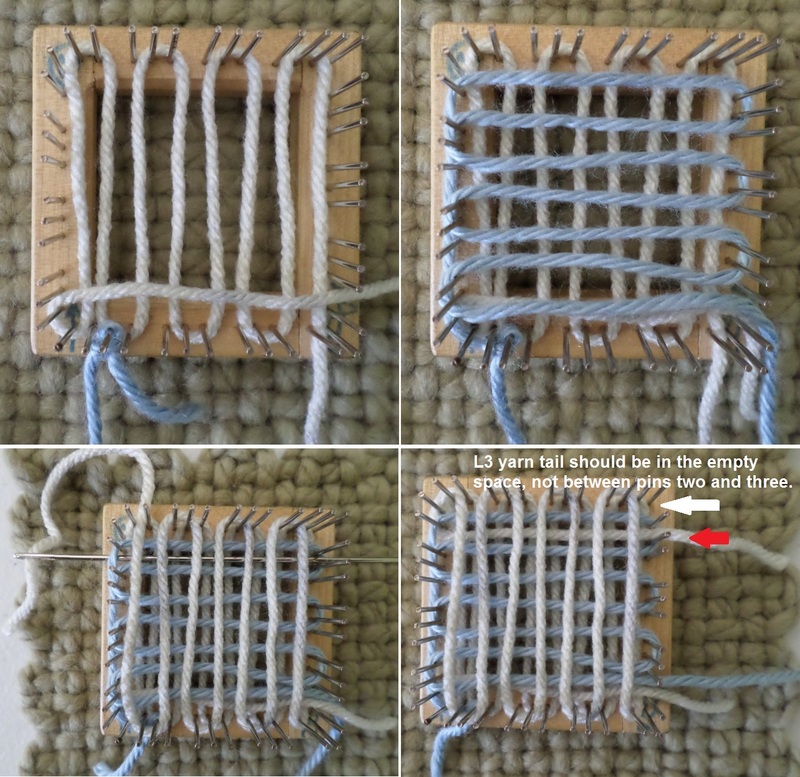 The yarn going diagonally across the loom in the first photo doesn’t mean anything. Just pay attention to how the yarn is displaced at the beginning of L1. 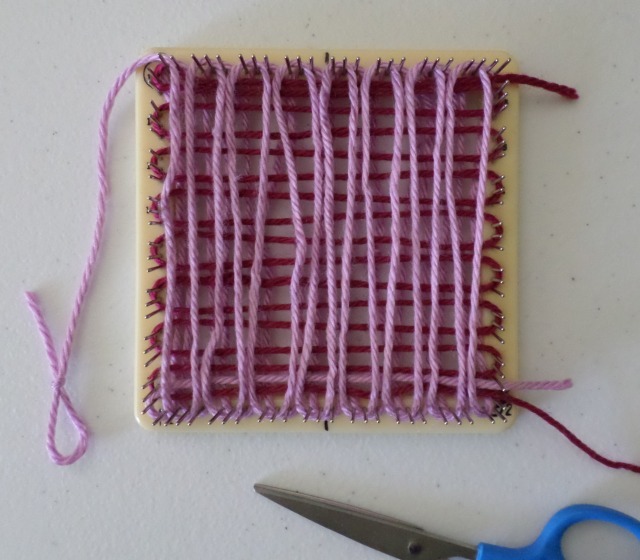 2″ square requires 3 wraps + length of one side. Thread the needle and slide it Under the L3 strands across the loom from 1-3 side to 2-4 side going Over the yarn tails on either side, but Under the L2 loops. Pay close attention to where the needle goes (but feel free to experiment too). Needle goes O L1 tail, slides U L3 strands. Exit U L2 loop and O L3 tail. Keep the yarn closer to the 1-2 side pins than the Color 1 yarn is. Keep Color Two below the L2 Color One strand as you pull the yarn into place. Leave a little bit of the tail sticking out on the 1-3 side. L4 yarn tail is in place. R1 in place with the needle. At beginning of R2, take yarn Over the L4 tail. 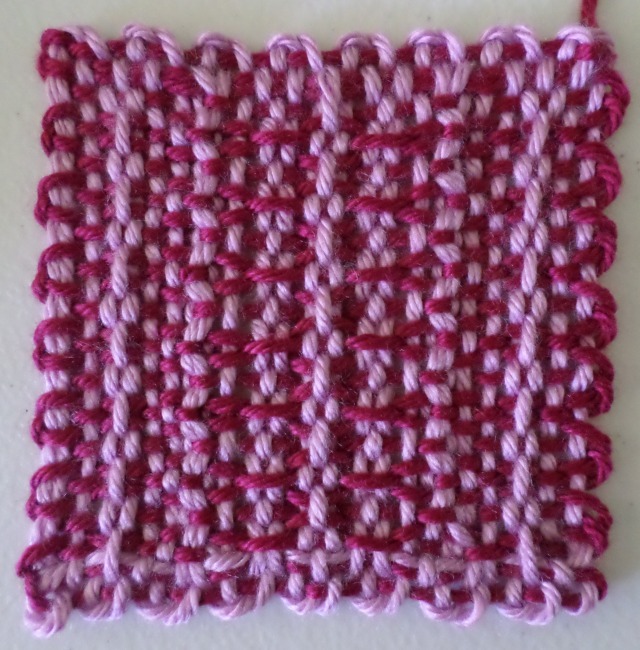 Continue weaving the square in your chosen pattern (or plain weave), pulling the loops outward and going Under the tails as you enter each row, then going Under the last warp strand and outer tail as you exit. Take yarn over L4 tail at beginning of R2. 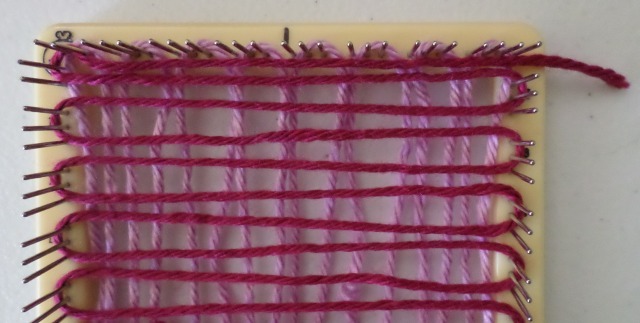 Always go Under both tail and first or last warp thread together at beginning and end of each row. 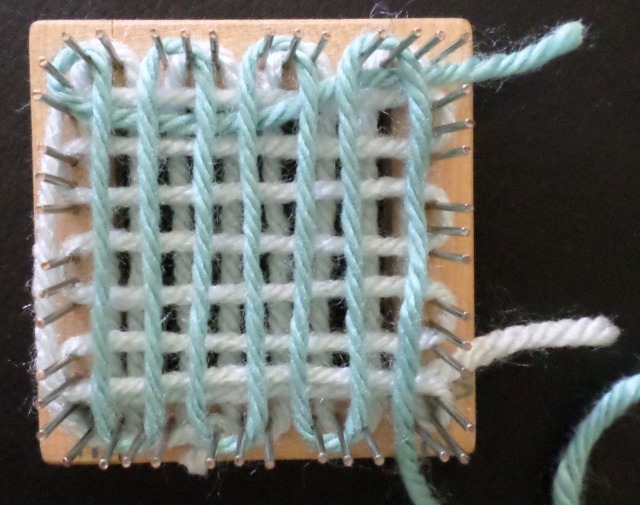 Because L1 and L3 tails are doubling up on the sides and the first L4 tail is doubled at the bottom of the loom, it’s recommended to work in the L4 horizontally at the top of the square (if you want to work in the tail). Enter the square below last row woven (in the sample, it’s R8) by taking needle Under outer tail, Over first warp, weave across; exit row going Under last warp, Over tail, Under outer loop–as in the photo. Work second L4 tail in horizontally. Under tail, Over warp, weave across, Under warp, Over tail, Under loop. 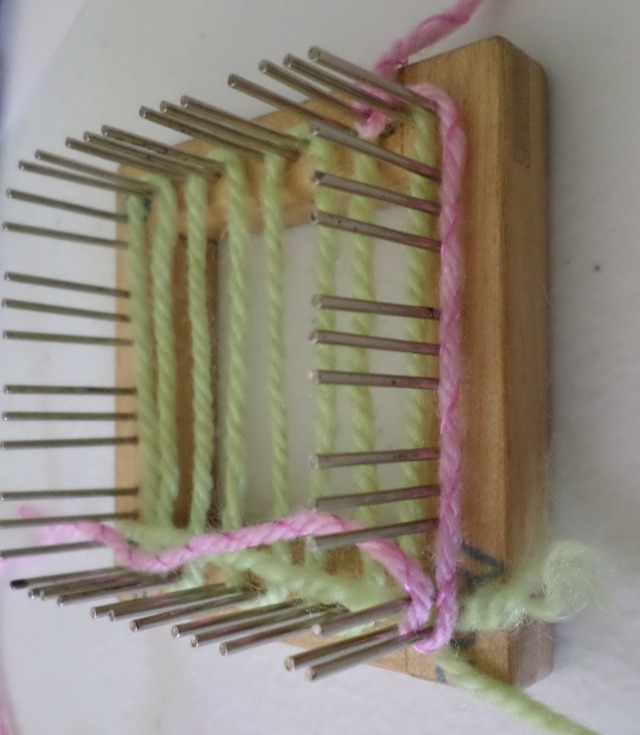 Remove from loom and trim ends. Tie L1 tails on outside of 1-3 and 2-4 side pins. Lay L2 tail in place horizontally with cut end sticking out of 1-3 side. Circle pins 2 and 3 of Cr2’s three-pin group. Place L2 in correct position, but with the cut end sticking out of 1-3 side. Circle Cr 2 pins #2 and #3. Bring yarn back over itself and warp L2-3 as usual. Warp L2 and L3 as usual. Wind pins, cut yarn, thread needle. L2 in place. Continue warping L3 and prepare for L4. R1: At Cr2, go U L1 tail, O L2 loop, U L1 first warp + L2 piece that encircles the pin. Weave across. Exit R1 U last warp, O tail (as always in two-color weave-in-ends-as-you-go method). R1 with needle in place. Close-ups of R1 beginning and end. Enter R2 going O L2 cut tail end. 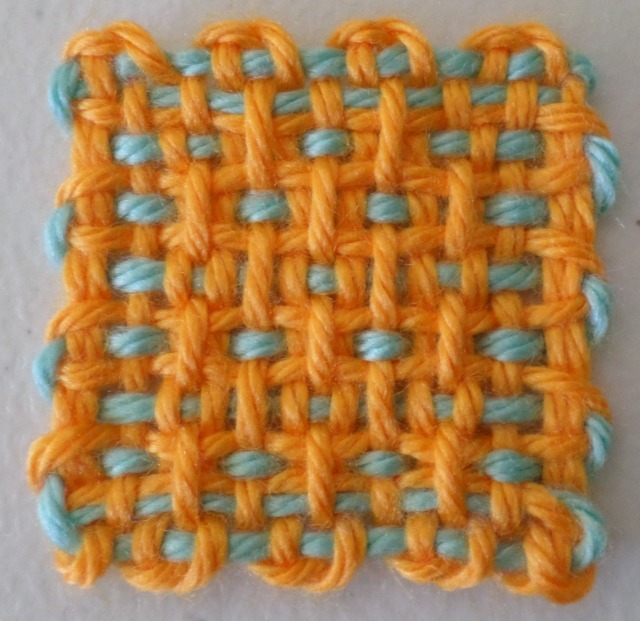 Continue weaving in pattern of choice as always in two-color weave-in-ends-as-you-go method, i.e. entering through loop and U both tail and warp strand; exiting U both. Close-up: going O L2 cut end at R2 beginning. If working in L4 tail: it should be worked in horizontally. You will need to exit last weaving row U last warp, O outer tail. Mimic last L2 strand. L1/L2-4 square with L4 tail worked in. Remove from loom. BEFORE cutting tails, gently tug L2 tail horizontally to take up slack at Cr 2. Tug L2 yarn tail horizontally before trimming. Now we’re getting into fussy territory. 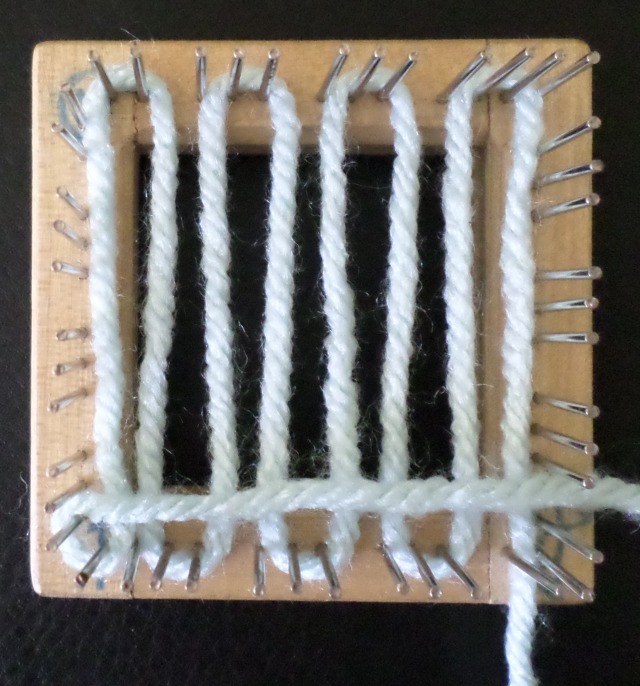 Warp L1, placing yarn tail horizontally across L2 as shown in technique 1 above. Warp L2 and tie off at Cr1. L2 ready to tie near Cr1. I moved the tie over toward the middle to avoid the Cr1 congestion. Place L3 tail across last strand of L2, with cut end on 2-4 side. Warp L3. L2 tied off; L3 begun. L3 ends at Cr 2. Wrap pins, cut, and begin weaving. L3 finished. Ready to wind pins and begin weaving. 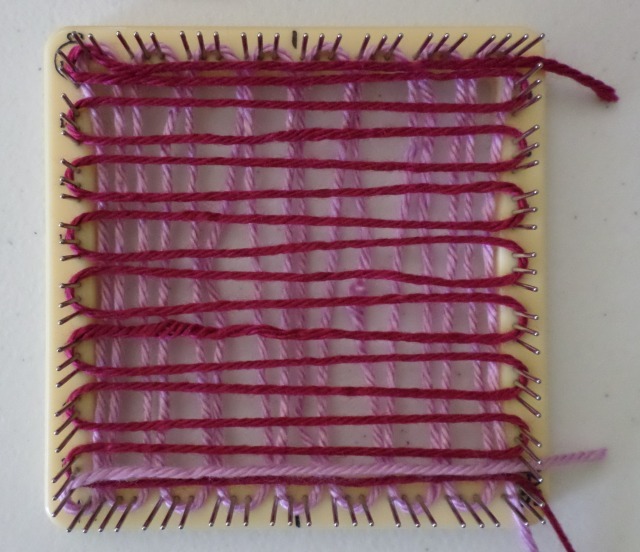 L4–weave as explained in previous methods. R3–catch cut end of L2 if desired. Finish L4. If working in tail, weave vertically from Cr4 to Cr2 (the only side that hasn’t been doubled up). 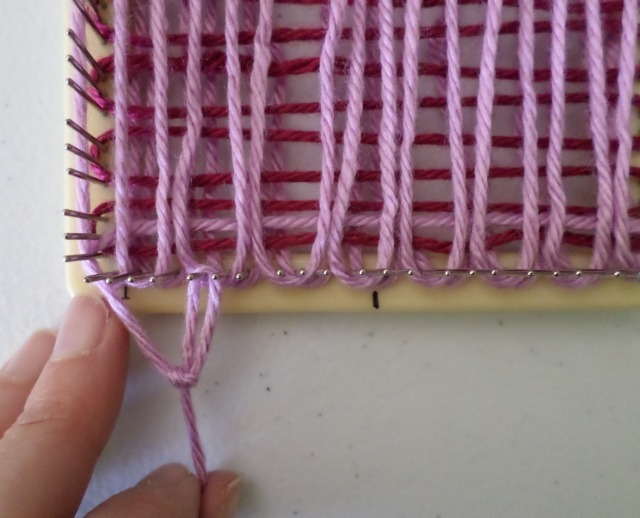 Or remove from loom and trim excess, leaving a sewing tail. This one is the trickiest of all. I have two versions for this one. Since I’m brand new to these techniques I haven’t practiced them a lot, so I may update the process as I get more practice with it. The first method is much harder, but it works better. The second is easier, but has drawbacks. THE PHOTO DOESN’T SHOW THIS, but begin the same as you would for one-color warping, laying the L1 tail vertically across the first L2 row. It doesn’t show in the photo because I laid the L1 tail in AFTER I finished warping L2. Either way works. L1 in place. You can put the yarn tail horizontally in place now or later on. Begin L2 at the top (3-4 side) of the loom. 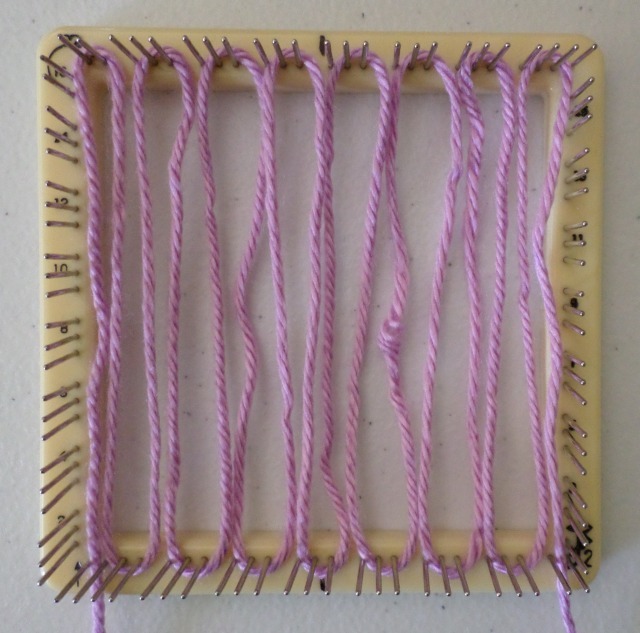 Lay first row in place with cut end in the first empty space at the top of 2-4 side of loom. On the opposite side, catch the first pin at the top of 3-4 side to anchor the yarn in place. 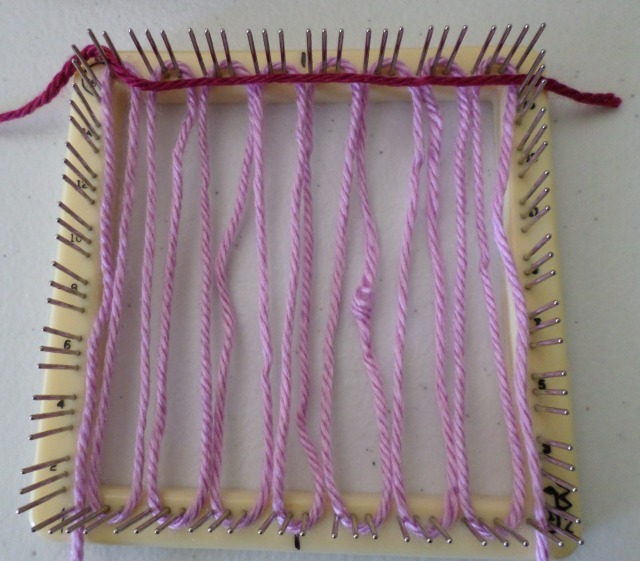 Begin L2 at the top of the loom and lay yarn tail in place as shown. Warp L2 “backward” from top of loom to bottom as shown in the photo. Be sure that the tail and the first row share the same channel (except for the pin catching at Cr3). While warping it may help to repeat to yourself, “Go into the empty space, wrap pins two and three.” L2 ends near Cr2, in the first empty space. L2 is warped backward (from top down). Close-up of beginning of L2 warping. Put L1 tail in place if you haven’t already done so. 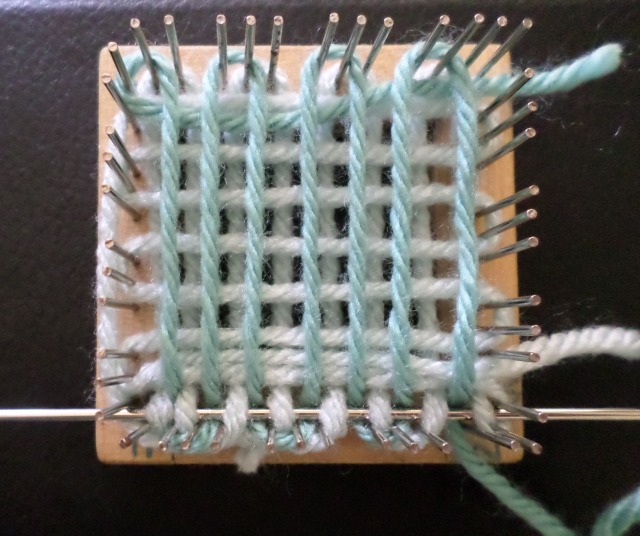 L1 yarn is placed horizontally across the lowest L2 row. 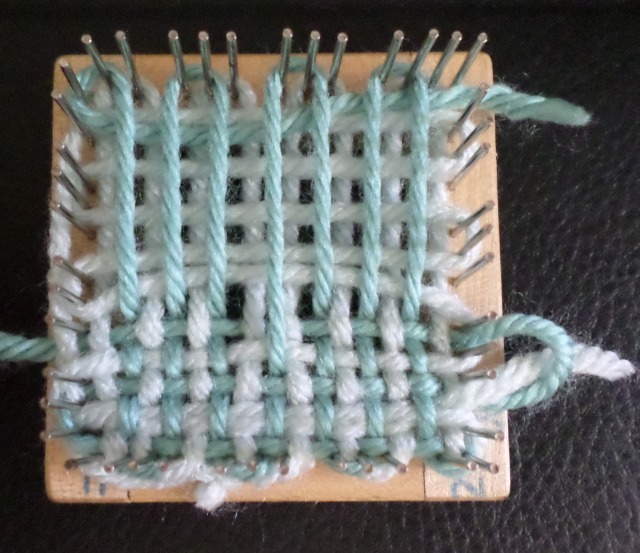 Warp L3 by wrapping one pin (instead of the usual two) at Cr2 and moving “backward” across loom. It may help to say to yourself, “Skip #3, wrap two and one, (then into the space).” Finish L3 at Cr3. Bring yarn to outside of pins, down toward Cr1. Cut yarn, leaving a generous tail. 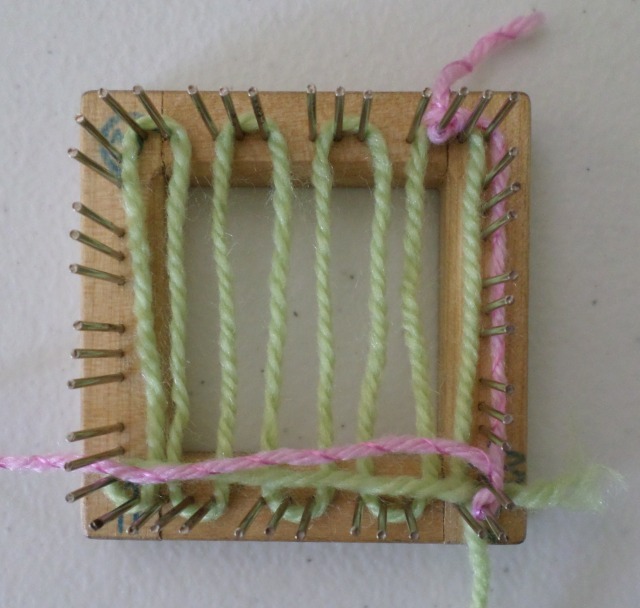 At the end of L3, bring yarn to outside of 1-3 side pins, cut, tie a slip knot and secure yarn to 1-2 side of loom. Tie slip knot and secure L3 tail to 1-2 side of loom (a bit toward middle of pins to keep it away from congested Cr1). 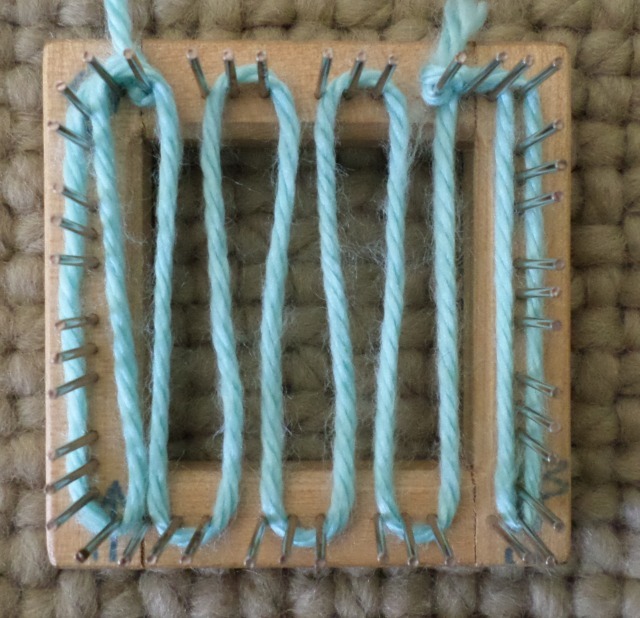 Secure L3 yarn tail to 1-2 side of loom. Trim excess slip knot tail, if desired. Prepare for L4 by wrapping yarn recommended number of times. Cut yarn, thread needle. L4, R1: enter in usual spot (note: you will wrap one pin only for this first row), exit row Under last warp. Because the outer tail will be trimmed a little higher up, it doesn’t matter if you go Over or Under it. Because there’s no yarn tail on the 2-4 side of the loom, enter R1 as usual. Exit R1 U last warp. It doesn’t matter how you deal with the outer tail. Continue L4. You may want to catch the L1 tail as you begin R3 to keep it out of the way. Securing L1 tail keeps it out of the way while you weave, but it isn’t necessary. 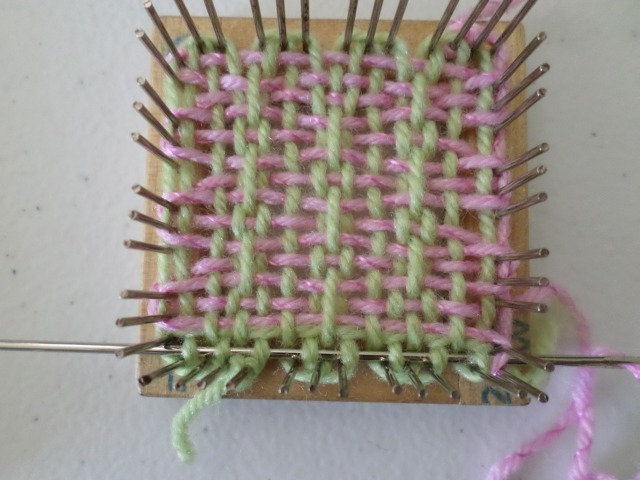 Continue weaving till you get to last row. At Cr3 you will probably need to lift the L2 loop (you used to secure the yarn when warping) off the pin. 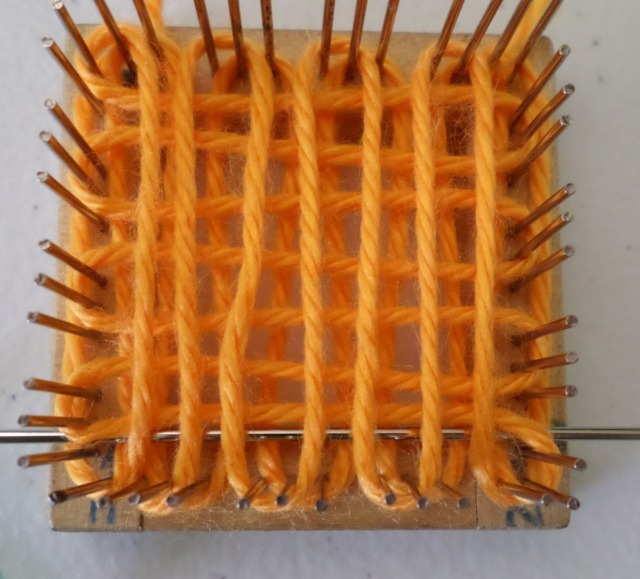 Insert the needle between the two threads that are sharing the last L2 row space, but then plain weave the last row of L4 above them. This is a bit tricky and I didn’t get a photo of it (Sorry! ), but I think you can see it in the photo. If you want to work in the L4, work it in vertically along the 2-4 side of the loom. Finished square with ends trimmed. Another option that also uses the backward warping for L2 is illustrated below. Warp L2 with yarn secured at Cr1, bring around outside of pins up to top L2 row. Lay it in position and warp backward down the loom. Warp L3, wrapping one pin at Cr 2. After warping, cut yarn, leaving a tail long enough to cross the loom horizontally. Thread needle and slide L3 tail under L3 warp threads into position in the same location as L2’s top row (Under L2 outer tail on one side and Under L2 outer loop on the other). Be sure to bring the tail out in the empty space, not between pins (see photos). 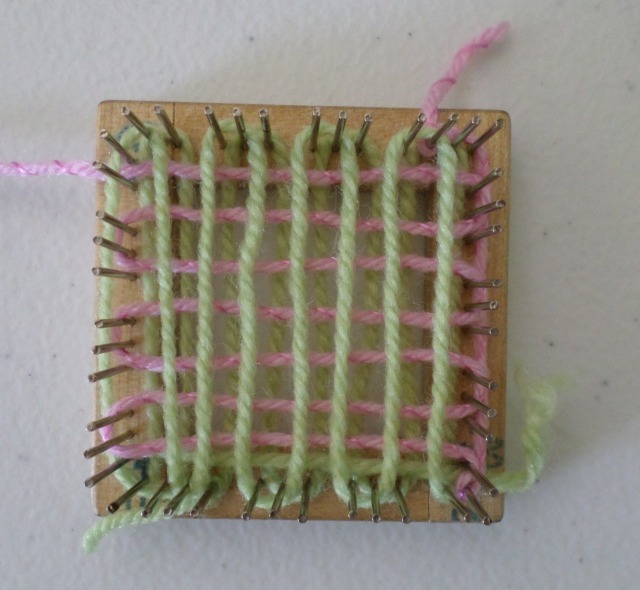 Have L2 go to the outside of the loom and have L3 go horizontally across. This keeps your double thick horizontal rows the same two colors. 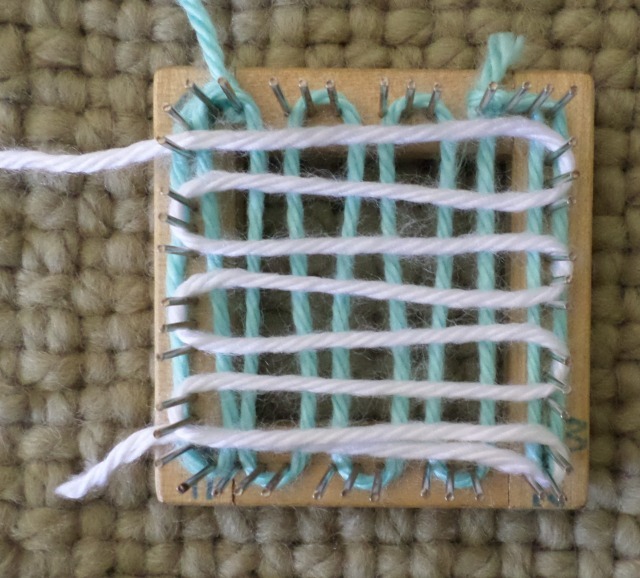 Weaving is a bit different because the L2 tail doesn’t go all the way to the top of the loom. 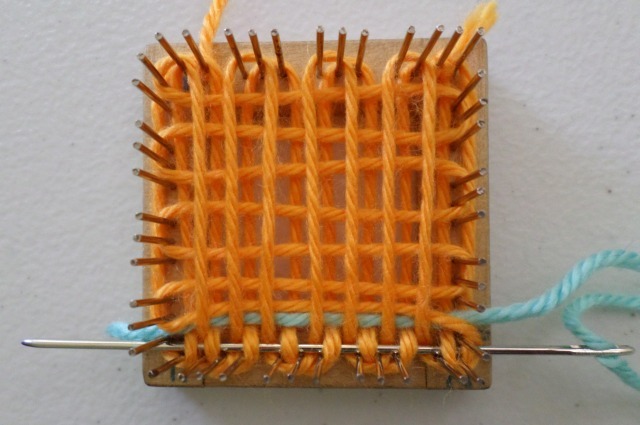 L4, R1: take yarn around one pin and Over L1 cut end. Weave across. At Cr1, go Over L2 tail; pull needle through, then take needle through L1 outer loop. R1 works best as a two-step process. Weave across, then go back and catch the underlying loop. Penultimate Row (R7 or R15): Exit going Over L2 outer tail loop. Second to last row: go Over outer tail loop. 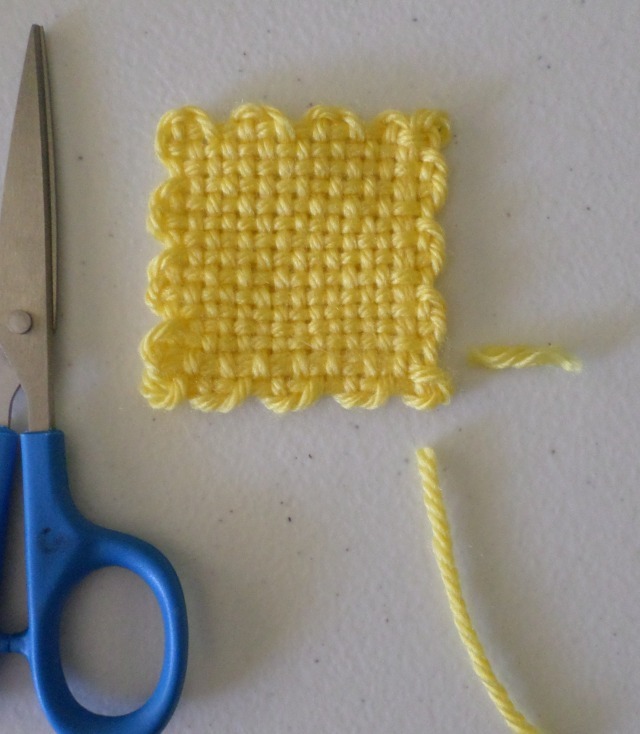 If you choose to weave in your L4 tail, work vertically along 2-4 side. Go Under L3 tail and mimic existing warp thread. 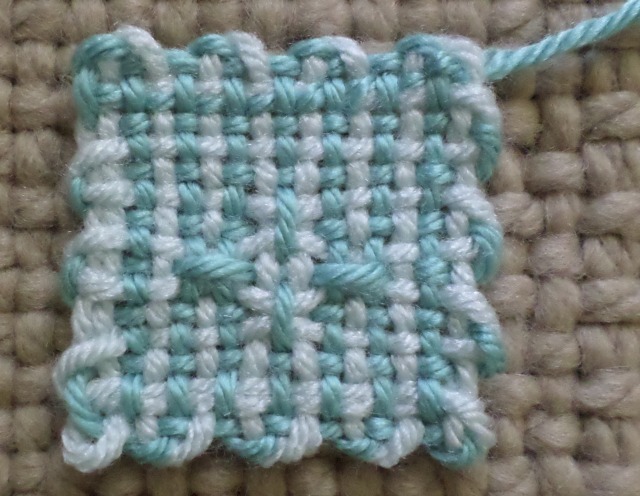 (However, this failed pattern required that I work my yarn end in horizontally.) Tug L2 outside tail end to take up slack after removing from loom. I recommend the first 5A method because this alternate method is super fussy. This method is a little easier than 5A, but it requires that L4 be woven from 3-4 side downward to 2-4 side. The L4 yarn tail will end up at Cr1 with nowhere to work it in (that isn’t already double up). This is fine if you plan to use it as a sewing tail because you can work in the leftover sewing tail across the 3-4 side. However, if using the mattress st/corner matching method of joining squares, let’s just say this method will mess that up. You can fuss with it a little, turn the square so Cr 1 becomes Cr 4, but be aware that’s what will happen. No problem if all your squares are made exactly this same way. Be aware also, when weaving from top to bottom, you’ll most likely need to work your pattern from R16 downward to R1. 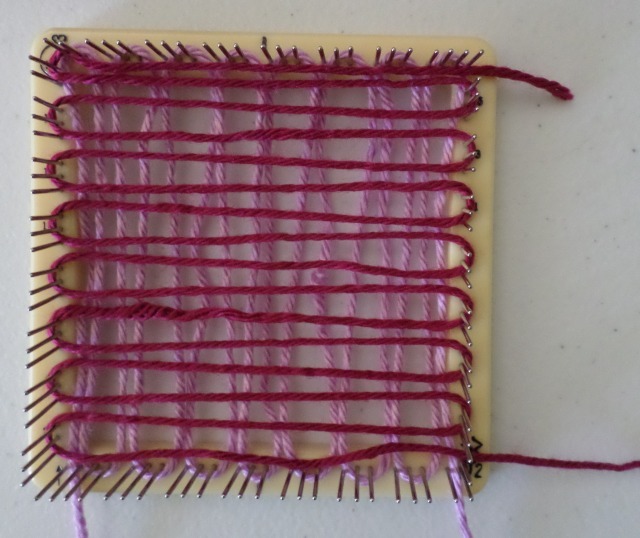 If using plain weave, no problem. Warp L1 as shown in one-color method above. Tie L2 color on near Cr4; bring to outside of pins and downward. Circle Cr2 pin (pin #2 of three-pin group). Bring yarn back to outside of pin #3 and continue warping as usual. Close-up of L2’s Cr2 yarn manipulation. L4, R1 (which might be R16 [or R8, if you’re using a 2″ loom])–FIRST ROW: I neglected to take a photo of this particular step, but you can see the result in the next photo. Enter first row Over (or through) outer (L3 tail) loop. Exit Under both (doesn’t matter since tail isn’t caught). L4, last row, close-up of row entrance. Finishing: before removing from loom, gently snug all tails if there’s any slack. 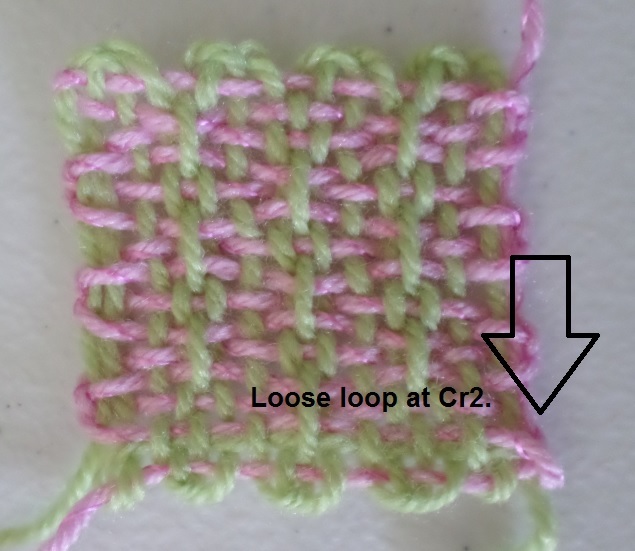 After removing square from loom, gently tug tail of L2 to tighten loose loop at Cr2. Remember that the finished square’s sewing tail will be at Cr1. 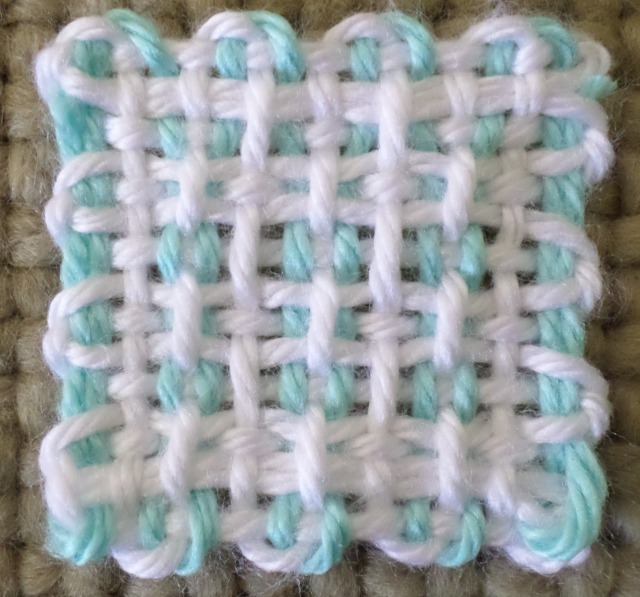 I don’t especially like the way this square turned out. I used baby yarn, so it’s not thick enough (I think my idea was that thinner yarn would make the steps easier to see). Someday maybe I’ll remember that the same value of pink and green don’t look good together. L1&3/L2&4 method B, finished square.